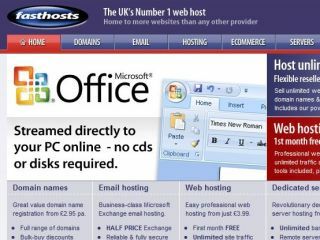 A UK web host is offering Microsoft Office 2007 on a monthly subscription from £5.86 a month. The boon is that you don’t have to fork out wads of cash for Microsoft’s key suite and there is no minimum monthly term. Fasthosts is offering Microsoft Office package to its customers under the Software-as-a-Service (SaaS) model. The £5.86 cost (£4.99 plus VAT) is for the cheaper Teacher and Student Edition, but you’ll still get Word, Excel, PowerPoint and Outlook. Should you want to be über honest and keep in with the man above, you can always op for the Professional Edition for £8.21 a month at home (£6.99 plus VAT) or pay £23.49 a month (£19.99 plus VAT) to have it at work. There are no discs or boxes supplied – you simply receive the software as a download. The apps then check every so often to make sure you are still paying your monthly sub. Aside from the regular checking with base (exactly how often that is we’re not yet sure), the software is identical to the existing versions. The downside of the offer is that if you keep it long enough you’ll end up paying more than simply shelling out for the full package. However, if you do decide to do that, you will get any updates made to Microsoft Office. The whole idea behind the Software-as-a-Service concept means you don’t pay for owning the software itself but rather for using it. As for more software packages being made available under the same premise, Jeffries added: “We will continue to develop new products that make full use of one’s internet access to fulfill software and other computing needs. Individuals and businesses alike can gain from the flexibility that internet-driven software can offer."